Our Approach Draws Upon Timeless Wisdom, and Provides Practical Guidelines for Applying these Principles to Our Modern Lives. Humans and organizations are multi-faceted by nature. We’ve found that the most effective approach to productivity involves looking at a person or organization as a whole. This is true, even if the ultimate goal is to focus on a specific area. For example, if you want to increase your productivity at work, it’s important to note that your effectiveness at work will be influenced in a positive or negative way by, for example, your health and your home environment. Simply put, productivity is all about producing the results that you want, either as an individual or as an organization. To be productive we believe that it’s important to look at the big picture, while also developing structure to support the day-to-day tasks and projects that ultimately bridge the gap between dreams and reality. 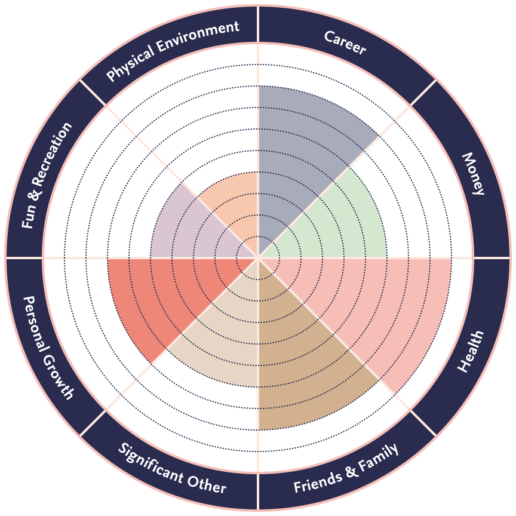 The Wheel of Life is a tool we use in coaching to evaluate your current level of satisfaction in various areas of life. Similarly, when you impact one area of your life in a positive way, this positive impact will also be felt in other areas of your life. For example, if you’re happy at work you’re more likely to be healthy and happy in your family life. The same philosophy can be applied to organizations. Even if the goal is to transform a particular department within the organization, it’s important to remember that the people that make up that group exist as part of a larger team. Any improvements within this department are felt throughout the entire company and the success of this department is influenced by the performance and morale in other areas of the company. These Four Core Practices Support the Holistic Productivity Approach to Life & Work. Inner reflection includes everything from noticing your physical body and where you’re holding tension to staying present to what’s most important in your life. Making inner reflection a regular practice is essential to living a life that is balanced and purposeful. Simply put, if you’re not accepting life you’re resisting life. Resisting takes energy and disconnects you from the flow of life. Acceptance creates a solid foundation for transformation. A profound shift is possible as you observe what you’re resisting and engage in a practice of acceptance. The third pillar of Holistic Productivity is about focusing on creating a positive shift in a few specific areas of life rather than trying to impact too many different areas simultaneously. Since all areas of life are connected, a positive shift created in one area will impact all other areas. Doing from a place of possibility and inspiration creates an experience of life that tends to uplift you and the people around you. Even the most challenging and mundane actions can become manageable and motivating if they’re approached from an inspired place. In a World Where There is So Much Competing for Our Attention, Holistic Productivity Creates an Opportunity to Feel Both Calm & Empowered. It’s a reminder for us all to be more present and to make decisions in a more mindful way. Our approach awakens something that is already inside of you; it’s not about changing who you are, but rather changing how you see the world and how you show up. In order to deliver on our promise, we are building a network of people just like you who want to transform their life and the role that technology plays in it. At Holistic Productivity, we do so much more than impart information – we create human connections. Having a group of likeminded people that you communicate with regularly is an essential ingredient for growth. It’s important to surround yourself with people you believe in and who believe in you. Holistic Productivity breathes new life into productivity by building communities based on trust and support.